The Model United Nations project is one that high school and college students take on all over the world. During the model United Nations project, students focus on finding solutions to a major global issue. Representing an individual country, students write policy papers and resolutions to solve the issue from their country’s perspective. At the end of the project, students participate in a model United Nations Conference. This conference is a simulation of a real United Nations Conference. In the conference, students debate and amend resolutions to be passed for the purpose of coming to a global solution each country can support. For this project I was the People's Republic of China. China has been proactively working on the climate change problem since 2005. China is part of the Permanent 5. The Permanent 5 is a group of countries in the Security Council that have veto power. It includes Russia, China, France, United Kingdom, and the United States. During our Model United Nations China (Me) proposed all of the amendments that passed and were added to our resolutions. 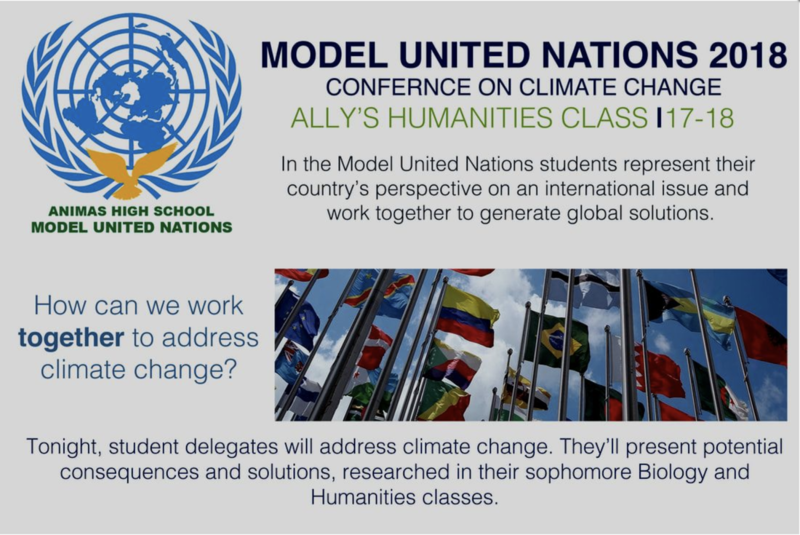 Our Model UN covered the topics of climate change and refugees. In our climate change portion I realized the problem isn’t people believing if climate change is real, the argument is about who’s responsible and who's going to pay to fix it. Before this project I looked at international problems through the lens of my own life. At the beginning of this project I realized that I was not going to be successful in this project if I continued to do so. I am a 16 year old boy from an upper middle class family that lives in a small mountain town in the United States. So understanding that me leaving my tv on when I fall asleep is contributing to families in the Philippines losing their homes to rising sea levels was not my first thought. When I really started looking into Chinese culture I realized that somethings that mean nothing to me mean everything to somebody else. I found myself jumping from research rabbit hole to research rabbit hole. I did this so much that I didn’t leave myself enough time to complete my policy paper or resolution. However I do feel like I had a better understanding of the importance of solutions that respect the views of everybody involved. I am hoping to participate in model un next year with the hopes that I will be able to write a policy paper and resolution that get put on the docket and respect multiple cultures. ​I have always to practice not getting into arguments about things that I don’t know what im talking about, and global issues were one of those things for me. I don’t know if I really fully understood what global issues even were before this project. I now feel like I could fully participate in conversations about global issues especially climate change. This project also showed me how often people tell people “facts” without evidence and how important it is to assume people are lying until their evidence shows you otherwise. I also realized how off my perception of China was completely off. Everything that I’ve seen about China in pop culture is that their people are being worked to death. However I learned that China is very proactive about problems and is willing to try new things and reevaluate if their initial solution wasn’t the best. They have been very proactive when it comes to climate change and already cut down on fossil fuel burning more than most countries new goals. As a developing country they are a great example for other developing countries to follow.